At her age, adult teeth are already forming! 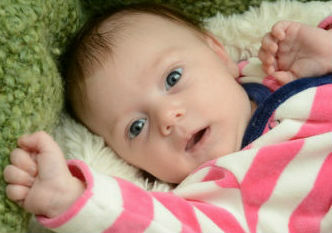 In our practice in Orange, CT, we see lots of kids as well as lots of moms with newborns. We often get questions regarding if and when fluoride should be incorporated into the diet of their newborn. Most parents are unaware that at birth, certain adult teeth are already forming! Even though these adult teeth will not start appearing until age six, they are beginning to form deep inside the upper and lower jaws. The chart above shows the initial calcification times for all the adult teeth. Why do we care about initial calcification times? Because this is when fluoride can be incorporated into the developing tooth structure! As you can see, at birth, the six year molars are already beginning to calcify. When fluoride becomes part of the developing tooth in a child, the tooth becomes stronger and more resistant to dental decay. For the adult teeth, this critical time begins at birth and continues approximately through age 8 (except for the wisdom teeth). Once the teeth are fully formed, the fluoride can only affect the most superficial layer of the teeth. This is why we do topical fluoride application on kids. Please note that excessive consumption of fluoride can lead to a damaging condition called fluorosis. For those mothers choosing to nurse, we agree with the adage “breast is best.” But for those opting to feed their infant formula, we always inform families of the option of buying formula with fluoride. Current recommendations from both the American Academy of Pediatrics and the American Academy of Pediatric Dentistry are to avoid fluoride supplementation during the first six months of life of your child. We agree with and adhere to these recommendations. Once your child is 6 months old, it may be beneficial to incorporate fluoride into the diet. One way to achieve this is to use a powder formula mixed with water that contains fluoride. 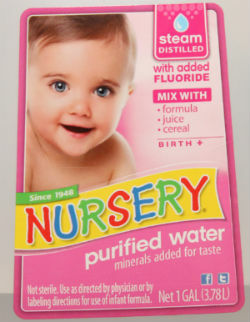 An example is Nursery Water (photo on the left) which has the appropriate amount of fluoride added to it as recommended by the American Dental Association as well as the Department of Health and Human Services. Another option is to mix the powdered formula with tap water if you live in a town with a fluoridated water supply. Orange, Milford, West Haven, Derby, New Haven and other local towns all have fluoride added. Some towns such as Woodbridge have homes with mostly well water. See here for a complete list of Connecticut cities and towns with fluoride. Should you supplement with fluoride? There is widespread scientific evidence which confirms that fluoridation can and will reduce the rate of dental caries in both children and adults. Each and every child is unique and has different risk profiles for developing cavities. Some kids have a consistent exposure to fluoride already while others do not. As a result, we always discuss various options, including no fluoride at all, with parents. Contact us with any questions or go to this page to request an appointment. Approximately 4 months ago, we published a blog post describing a relationship between tooth loss and pregnancy. The theory was that pregnant women avoided dental care due to fears over the possible impact of dental treatment on their pregnancy. The findings of the study confirmed a greater incidence of tooth loss in women with children . In a recent issue of Obstetrics and Gynecology, the American College of Obstetricians and Gynecologists (ACOG) published recommendations regarding dental care during pregnancy. These recommendations were based upon years of research on the impact of oral health on pregnant and post-partum individuals. OB/Gyns should discuss oral health with all patients, especially those who are pregnant. Pregnant women should be advised by their OB that by improving her oral health, she is less likely to transmit the cavity producing bacteria to her infant. OBs should inform patients that diagnosis of oral conditions, including dental x-rays, are safe during pregnancy. OBs should inform their pregnant patients that certain conditions (dental abscesses, dental caries, pericoronitis, etc.) may require treatment during the pregnancy. In general, delaying treatment may result in more complex problems. Patients who experience morning sickness are at a greater risk for dental decay. We have had the privilege of caring for hundreds of pregnant and post-partum women over the years. In most cases, we simply perform a routine cleaning and inform the patient of our findings. 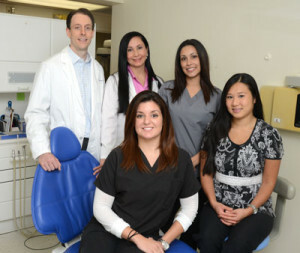 By doing so, we have been able to educate on the importance of oral health as well as help prevent future tooth loss. If you are expecting and have a dental question, feel free to call us for an appointment.